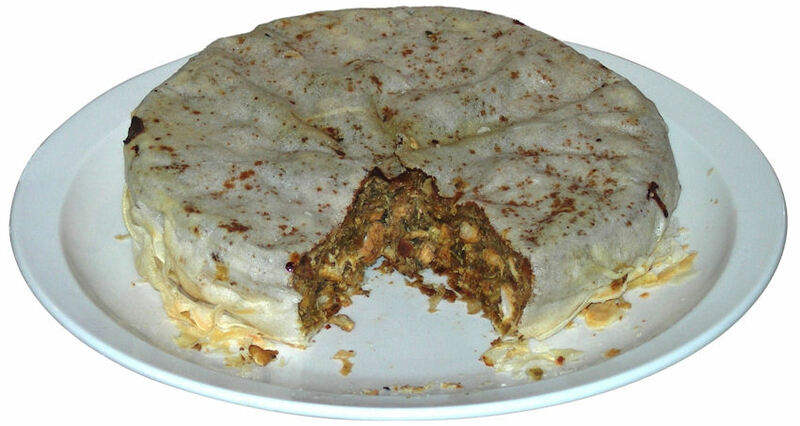 In its modern form, a pastilla is an elaborate, layered, savory meat pie of Moroccan origin. 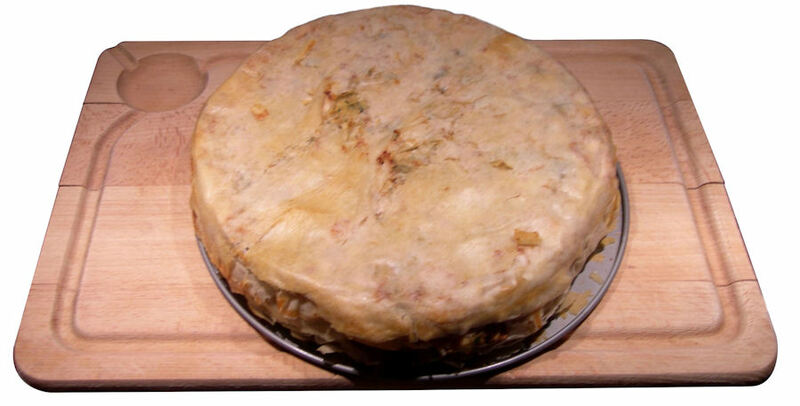 It is bastila (pronounced in English as "basteela"), bastal, bestila, besthila, bastila, bastilla, pastel, pastelis, pastela, b'steeya, bisteeya, biastayla, bistya, etc., depending on whether you are (or claim the roots of this dish are) Iberian (Spanish, Portugese, Mozarab), Latin, Arabic, Moroccan Arabic, or Berber. The dish probably migrated to the Iberian peninsula (current day Spain and Portugal) during the Moorish conquest of the 8th - 10th century. Traditionally it is made with the meat of baby pigeons ("squabs"). Where I live these days, supermarkets typically don't carry that kind of meat, so chicken is used instead. I was introduced to this pie at one of the convivial dinners at the local flying club at Toulouse/Blagnac airport, where one of the ladies, Marion, had gone through the great effort of preparing a number of them. She kindly shared her recipe with me. It only had amounts for about half of the ingredients, so I adjusted them to my liking. I also adapted it to baking the pie in a springform pan, which works very well. Use a kitchen machine to chop the onions in 2 seconds! Make the pieces about 2-3 cm (1 inch) in size. 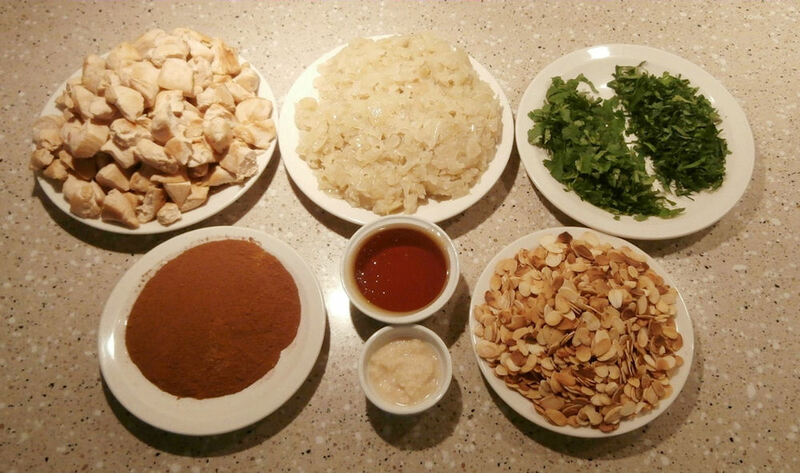 Do not make them smaller, as the chicken will shrink while cooking, and small pieces will get dry. They will be cut after cooking them. Note: some recipes use shredded meat, instead of diced. The pan has to be big enough such that all pieces of chicken easily fit on the bottom and are not on top of each other. I recommend frying the meat in two batches. The pan has to be hot enough to sear the meat. If the pan is not hot enough, the chicken will get boiled instead of cooked & browned! If the meat releases water: the pan is not hot enough! Put the pieces of chicken into the pan, and leave alone for about 3 minutes, then turn over. Brown the pieces on all sides. Do not overcook, as the meat will become dry. Don't worry: it will continue to cook for a while once removed from the pan, and will also be baked in the oven. In the large wok, slowly cook the onions in couple of tablespoons of vegetable oil until soft - takes about 15 minutes. Do not fry them! First heat up the oil, then add the onions, and reduce the heat to a bit more than "low". Stir and spread out the onions regularly. I do this with two wooden spatulas. If any parts turn brown, reduce the heat immediately! Keep the heat on "low"
The sheets are larger than the diameter of the pan - fold the excess part of the sheets upward against the inside of the rim of the pan; it will be a bit ruffled. Put half of the chicken & onion mix into the dough "basket"
Spread out the filling evenly and push it up against the dough and the wall of the springform pan. Use a table knife to pull back those sheets a little from rim of the pan. Try with adding half a cup of yellow raisins, soaked in hot water or sweet wine, to the filling. 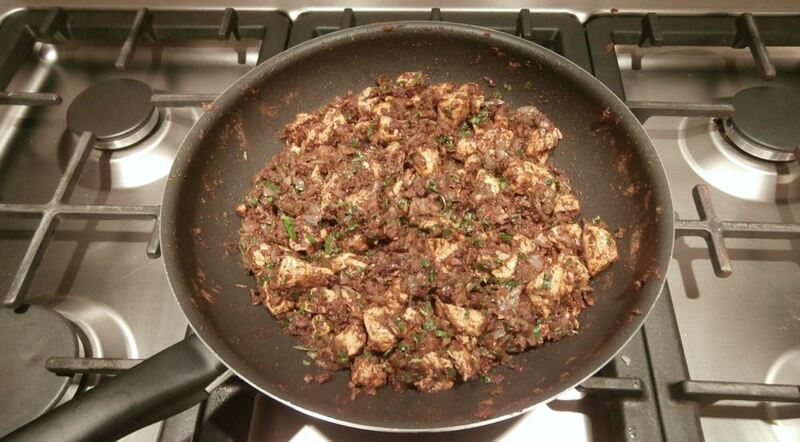 Try with ground lamb meat instead of chicken. Some people use Moroccan "Ras el Hanout" spice mix instead of mixing the spices listed above as part of the ingredients. Some people sprinkle the top of the pie with powdered cinnamon and sugar, before the final baking. The filling can also be rolled into pastry dough, to make ca. 10 cm (4 inch) long rolls with the ends pinched, and deep fried. This process is similar to making triangular Indian samosas. ©2006-2017 F. Dörenberg, unless stated otherwise. All rights reserved worldwide. No part of this publication may be used without permission from the author.